Home | Ladies Jewelry | Bargain Priced Necklaces and Chains | 14k Gold Byzantine Necklace. 65% off!!! 14k Gold Graduated Byzantine Necklace, Made in Italy. Impressive 14k Yellow Gold Graduated Byzantine Necklace designed in brilliant craftmanship. Made in Italy. The byzantine necklace graduates from 6mm wride to 14mm wide going from the clasp to the center of the necklace. This 14k gold byzantine necklace weighs approximately 19.2 grams. It looks great on the neckline as it presence elegance. The necklace is secured with a large spring ring clasp. An appraisal certificate will be shipped with this item. The appraised value is $3965.00. 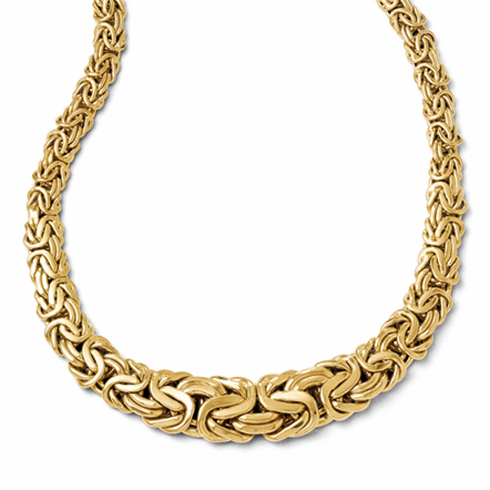 This 14k gold byzantine necklace comes with a lifetime guarantee.